Role play toys are one arena on which Kenner never focused their Star Wars toy license. Beyond the few electronic guns that were issued and the three Canadian utility belt sets, no real role play toys were issued during the vintage years, despite the proposals of Kenner's designers. 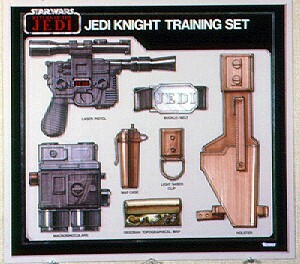 This image shows a hand-rendered proposal for a "Jedi Knight Training Set." It repackages the popular electronic blaster with binoculars, a holster, a belt and some other assorted doo-dads. In his excellent book, Star Wars: From Concept, To Screen, To Collectible, Steve Sansweet showed a few of these sets, including a super-nifty Boba Fett-themed example.